Exceptionally restyled with good looks with the benefit of more safety tech. Everyone is familiar with the Nissan X-Trail having a familiarly boxy body for two generations. For this one though, all of those boxy angles have been thrown out the window. With this refreshed version of the third generation model, its flowing and dynamic profile has further been redefined, with the addition of new safety features under the Nissan Intelligent Mobility umbrella. It’s a facelift that, while minimal, have done a really good job to spice the car’s looks. While it’s one of the few compact crossovers with seven seats in the market, are the seats, gorgeous looks, and new safety tech enough for it to compete in a competitive compact crossover segment? Let’s find out. If looks are everything, I’d give the X-Trail an almost perfect nine out of ten score. 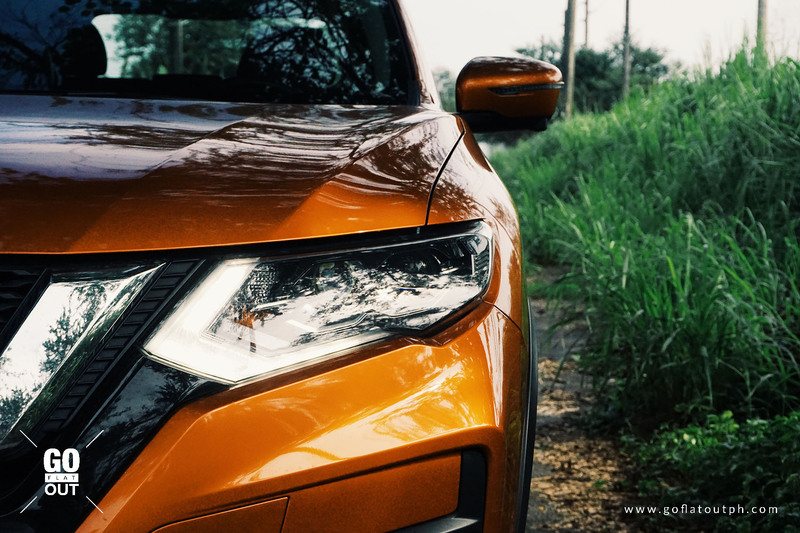 The refreshed Nissan X-Trail just oozes style, from the way this Premium Corona Orange perfectly radiates the car’s gentle curves and sharp lines, all the way to the gorgeous new 19-inch two-tone alloy wheels. These are small changes for what is essentially the same SUV we’ve seen since 2015, but they all work perfectly in harmony to make this X-Trail one of the best looking crossover SUVs out there. I say nine out of ten because the Mazda CX-5 is still the beauty queen in the segment, but the X-Trail is right there on the rankings in terms of style and presence. The V-Motion grille has been enlarged, while the lower front bumpers and foglight housings have been restyled to give the X-Trail a commanding road presence. This, in conjunction to the Adaptive LED Headlights with the trademark boomerang LED daytime running lights give the X-Trail a modern look both in the daylight and at night. 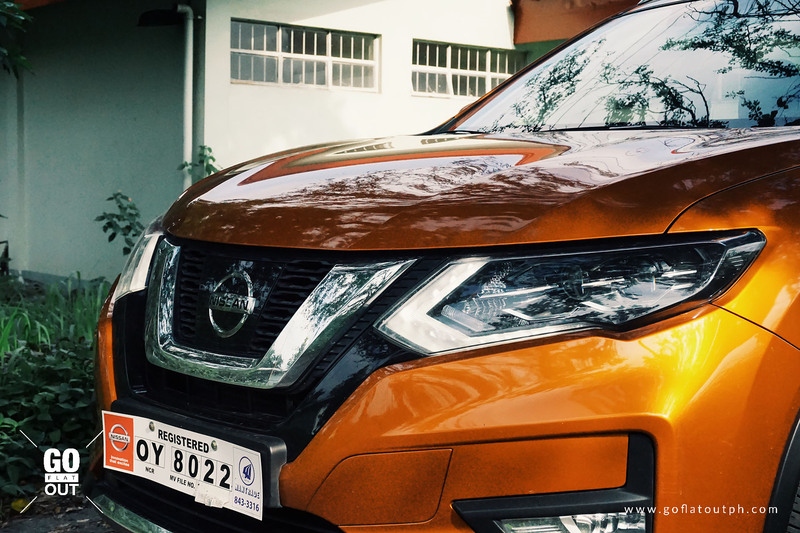 At the back, the Nissan X-Trail’s rear lights have been given the LED treatment, mimicking the boomerang shape from the daytime running lights. Again, these are small changes, but they work so well that I just keep on looking back whenever I park this thing. The interior also receives the same minute but welcome changes. There’s plenty of soft touch materials that make the interior feel premium. 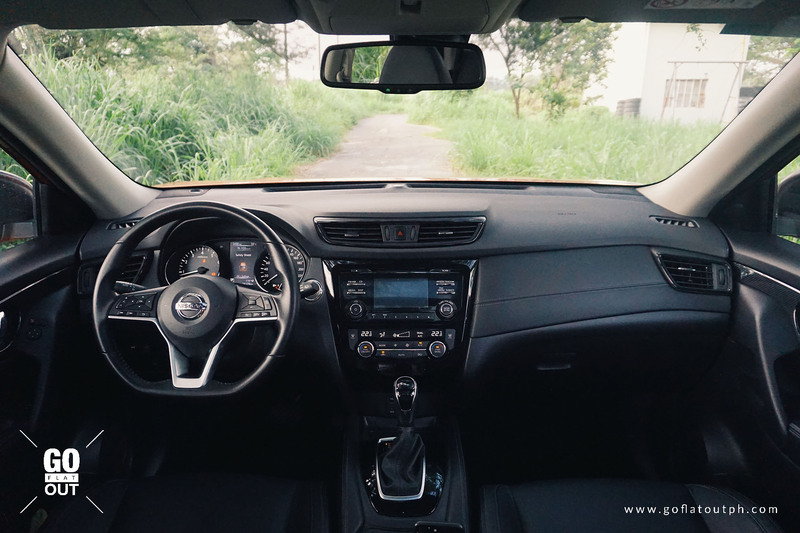 For this year, Nissan has added some leather padding with stitching on the dashboard and side knee pads, plus a healthy dose of satin chrome trim that’s tastefully done. 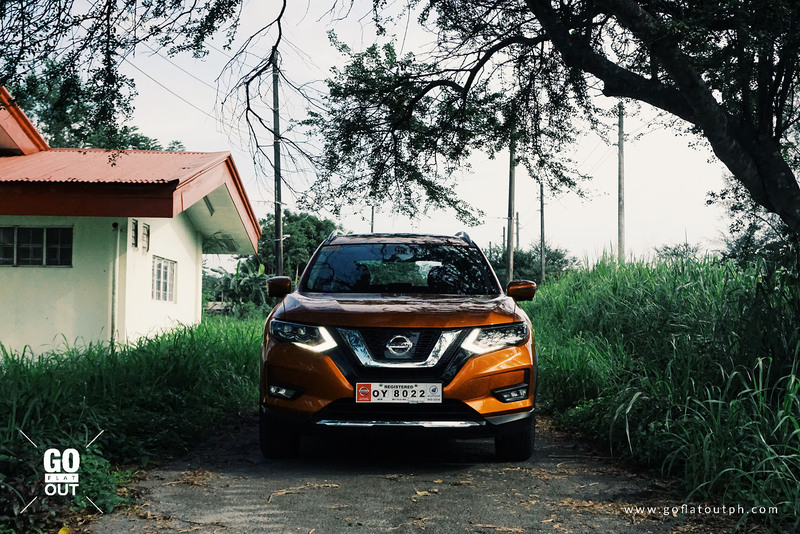 Like the exterior, the changes are very minimal, but they all once again work together so well that the Nissan X-Trail exudes a feeling of authenticity. A feeling that the materials used look and feel more premium than the price tag suggests. Sure, there are some hard plastics at the bottom parts of the interior, but they’re mostly in places you would rarely touch. It’s all mostly done in black, but the execution is wonderful. It’s a step in the right direction for the X-Trail’s mid-cycle refresh. The driver is also greeted by a TFT color LCD screen with revised graphics sandwiched between a legible pair of LED-lit gauges, providing information in different aspects of the car. At 4,690 mm long, 1,830 mm wide, and 1,740 mm tall, the Nissan X-Trail is in the larger spectrum within its segment. With its 2,705 mm long wheelbase, this feeling of size is translated to the interior, where there’s an excellent amount of space for both the first and second rows. 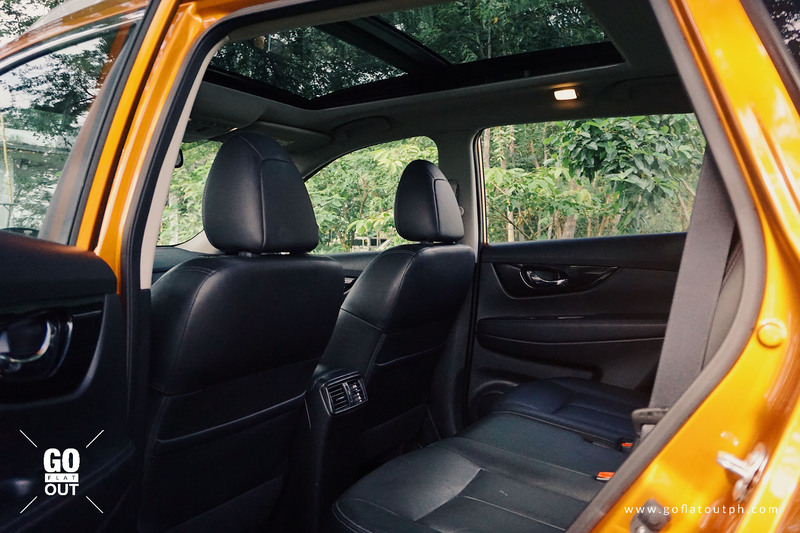 The feeling of spaciousness is further amplified by the gorgeously big panoramic sunroof. Both the driver and front passenger seats have 6-way electronic adjustment, with the driver benefitting with the addition of lumbar support. Along with the tilt and telescopic steering, any driver will be able to find a comfortable driving position. There’s also a good amount of storage bins up front, all of which are generous in size. Those at the back, meanwhile, are treated to rear aircon vents and a sliding rear seat. The floor is almost flat, giving ample space for everyone’s feet. That feeling of spaciousness doesn’t translate to the third row seats though. They’re more for occasional use, or for small kids. It’s a knees up situation due to the low seat height, plus legroom is poor for tall adults like me, who felt it was like a torture chamber back there. At least you have the flexibility if the need for a third row seat arises. At least these third row seats fold neatly flat. Once folded, you wouldn’t even notice that the X-Trail has seats under there. It’s that well thought out. 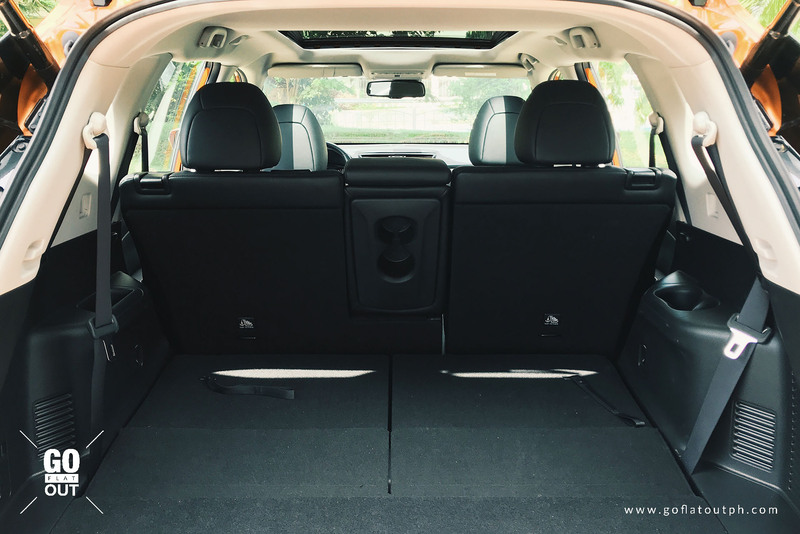 Along with the hands-free powered liftgate that can be opened by waving your foot under the trunk, loading items inside the X-Trail is very easy. Folding the second row seats down creates a perfectly flat load area that even a camping bed could perfectly be laid inside it. This top shelf X-Trail 2.5 AWD variant is well-equipped with features that range from those aforementioned Adaptive LED Headlights with boomerang LED daytime running lights, automatic wipers, power folding mirrors, leather interior, an automatic opening liftgate, panoramic sunroof, and a host of safety features that we’ll be discussing in a few. 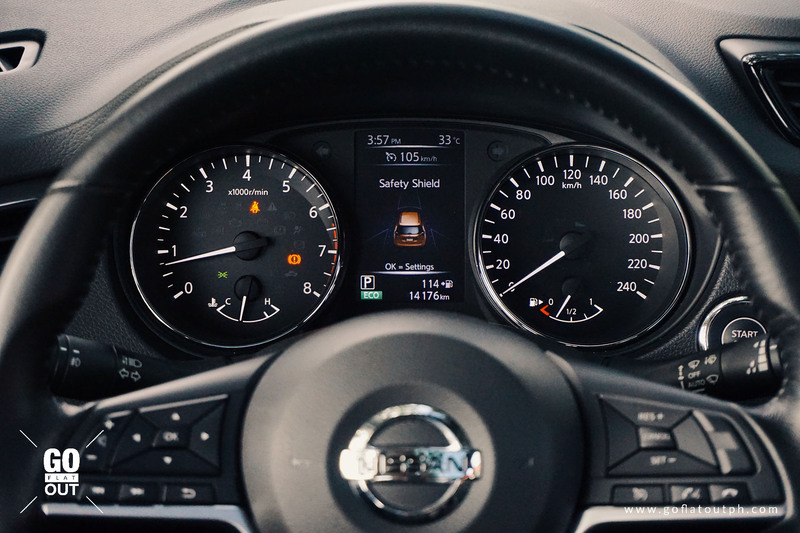 The first is the Nissan Intelligent Mobility suite of safety features. These encompass a wide range of safety features that include Forward Emergency Braking, Forward Collision Warning, and Blind Spot Warning with Rear Cross Traffic Alert. These features work well to prevent the driver from getting into an accident in the first place. Forward Collision Warning and Forward Emergency Braking work particularly well. During the entire period that the X-Trail was with me, there was not a single false alarm or false trigger that happened. 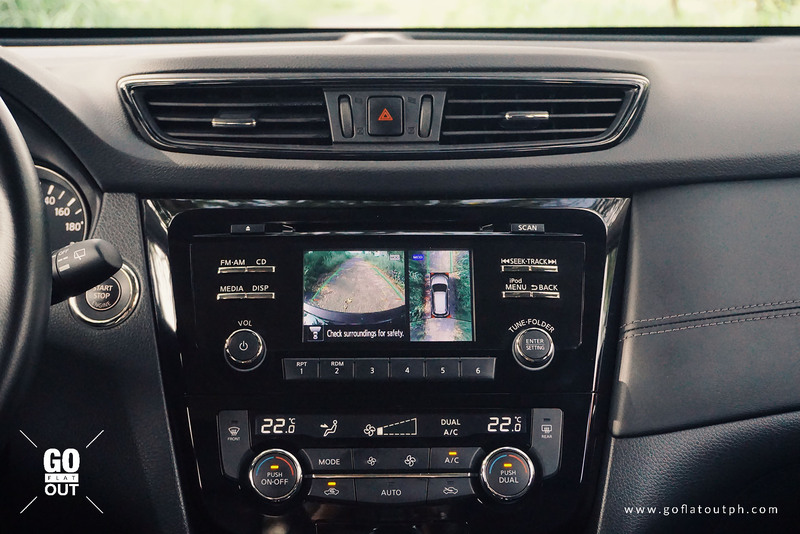 Next is the X-Trail’s 360 degree Around View Monitor (AVM) cameras that provide a sort of “bird’s eye view” of the car by stitching together the cameras located under the wing mirrors, front grille, and rear trunk. A minor gripe is that the 5-inch infotainment screen has a low resolution, making it difficult to accurately pin point small objects. It also has Moving Object Detection, which I found the warning sound to be too soft, and the pale yellow indicator in the screen that shows where the moving object is seems to be easily washed out by the image. Nevertheless, these features work well enough that they provide a level of convenience to the driver when parking. The AVM also works when driving forward below 10 kph, and it can also show the right front wheel, which is useful when driving in extremely tight city confines. However, for a car with numerous advanced safety features, I’m very surprised that the X-Trail only has two airbags. 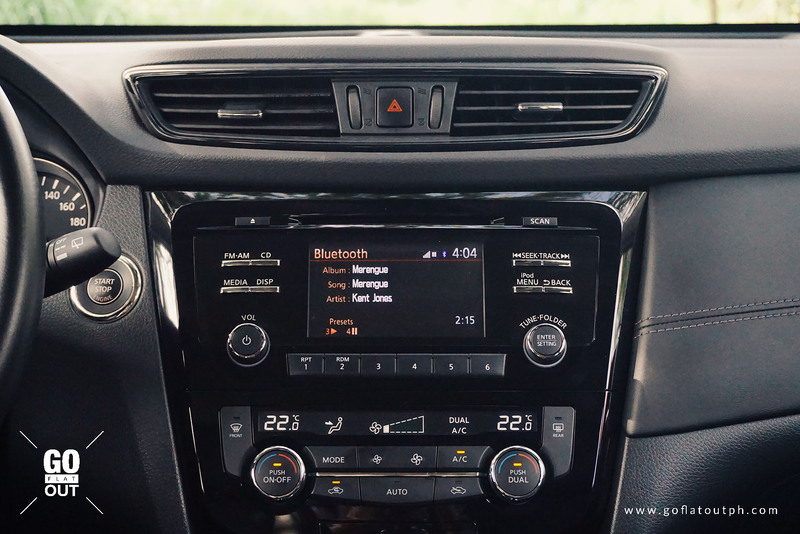 The infotainment system is nothing to write home about either. It’s a 5-inch color screen that isn’t touch operated. Rather, there are large buttons surrounding the screen. At least the system is user friendly and easy to operate on the move. 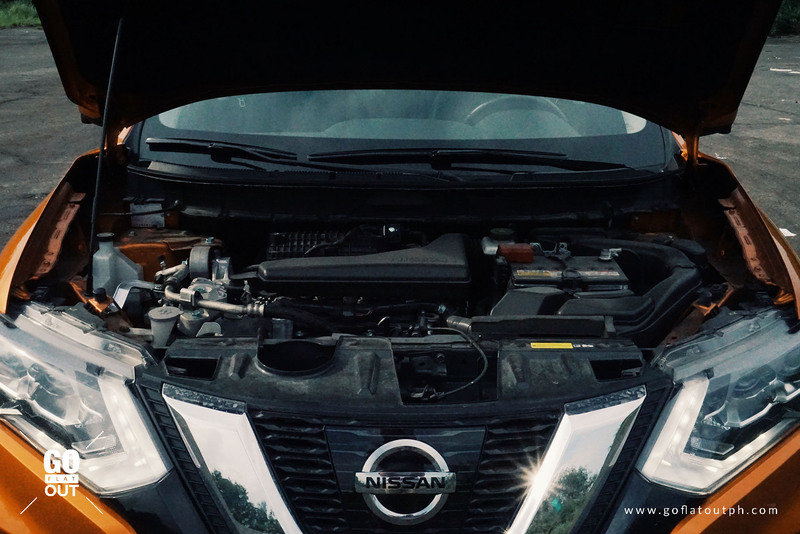 The Nissan X-Trail 2.5 AWD is powered by a 2.5-liter inline-4 petrol engine that produces 169 hp @ 6,000 rpm and 233 Nm of torque @ 4,000 rpm, mated to Nissan’s XTRONIC CVT. Power is then sent through an intelligent 4×4 system that can switch from permanent 2WD, intelligent 4×4, and 4×4 lock, making the X-Trail one of the more capable compact crossover SUVs out there. With its 2.5-liter inline-4 engine that’s teamed to an XTRONIC CVT, the Nissan X-Trail offers strong acceleration off the line. It’s nothing that’ll set anyone’s pants on fire, but it’s perfectly adequate that I didn’t feel that the car felt strained. This is thanks to the CVT, because while it holds the engine’s revs, it keeps the engine within its optimum rev range for excellent torque delivery. Despite the CVT’s way of delivering the power from the engine, the cabin remains hushed. Improvements were made by Nissan’s engineers to make the X-Trail more refined than before. The slight chink in the armor would be some wind noise coming through the windows, but nothing major that I could complain about. The X-Trail’s relaxed nature are further helped by its suspension that offers a balance between comfort and sport. It won’t run rings around a Mazda CX-5, but along with the X-Trail’s Chassis Control system that offers torque vectoring, the X-Trail corners relatively well for its size. The torque vectoring system helps the car rotate better by braking the inner wheel, making it feel smaller than it really is. It’s a good thing that the throttle response is supremely sharp and very eager to accelerate. Because of this, I left the car in ECO mode since the throttle felt adequate enough to keep the car moving in this mode, whilst being able to return commendable fuel economy, which we’ll get to in a minute. Its steering, though lacking in feel, is somewhat accurate and very light to use in the city, making it easy to maneuver through tight city confines and when parking. In long distance drives, the Nissan X-Trail is an excellent road trip companion. I took the whole family to Clark and then back to Sta. Rosa the following day, and we barely had any sore butts during the long drive. It’s a relaxing long distance cruise that makes long distance driving effortless, though the 19-inch alloy wheels with low profile tires somewhat transmit some harshness through the cabin, and when they do, the X-Trail can take time before it settles. In this regard, a Honda CR-V feels more buttoned down to drive. During the time that the X-Trail was with me, it achieved a fuel consumption of exactly 10 km/l, which is pretty good considering that this is still a relatively big 2.5-liter naturally aspirated petrol motor without the magic of downsizing and turbocharging. Major downsides? Well, there aren’t really any, though I really must point out that the Nissan X-Trail only has two airbags, which I find odd, considering the amount of sophisticated safety gear that it gets. Also, the warning sounds could be louder, as these can easily be drowned out by the music you’re playing through the speakers. 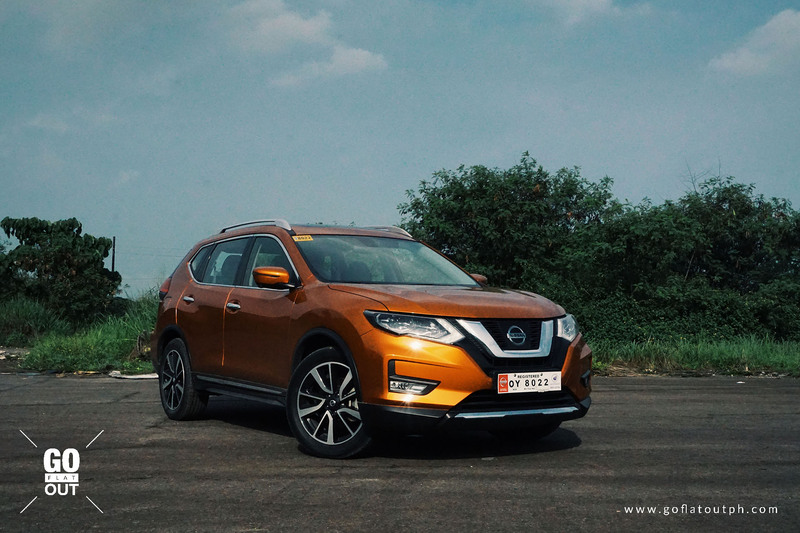 The Nissan X-Trail 2.5 AWD is one of the more affordable options of the top trim variants of the compact crossovers out there, since many of its rivals fly above P2 million. Given the amount of smart new safety features, gorgeous new looks, and commendable driving dynamics, the Nissan X-Trail offers an excellent value proposition to its customers. It’s not yet genius level in terms of safety features, as it lacks goodies such as Adaptive Cruise Control, Lane Departure Warning, and Lane Keeping Assist, but then again, these features might make the X-Trail cost even more. As it stands, at its current P1,820,000 price tag, it offers a great trade-off compared to its more expensive top trim rivals. Unfortunately, it has to face-off with its toughest competitor yet, which is the Honda CR-V i-DTEC. 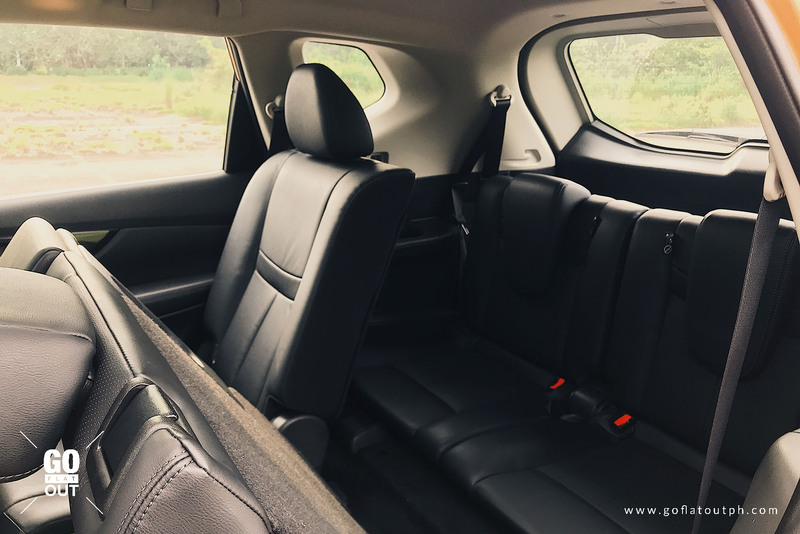 The X-Trail’s seven seats, which was once its selling point, is now something that the Honda engineers have taken note of. The refreshed Nissan X-Trail is gorgeously smart. It think it has one of the nicest designs out there, whilst being bundled with the brand’s suite of intelligent safety tech to keep it competitive in its segment, but its rivals have also intensively upped their game.